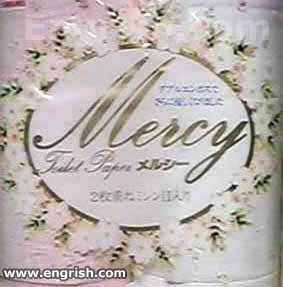 ‘Mercy’ toilet paper – for the good wipe. The brand that’s willing to put up with your crap when others don’t. Most toilet papers won’t be so merciful. Have mercy on your bum! don’t confuse with cheap imatations like Merky or Messy or Malevolence. Finally, the paper that shows some mercy! Your sphincter will be screaming for it. When you run out of toilet paper, you’ll ask for Mercy. Even Charmin isn’t this easy on your rear end!